I used to use Xming for an X server for my Windows 7 PC. I started looking out for other X servers for Windows because of a particularly irritating bug of Xming. Sometime Xming interferes with the clipboard, so that cut/copy/paste no longer works. The bug blocks the clipboard not only for X applications but also for native Windows applications. Quitting Xming doesn’t get the clipboard functionality back. Even after quitting Xming, a residual process would still be running which continues to block the clipboard. It has to be manually killed from the task manager. Finally, I found an alternative that is as capable as Xming but doesn’t block the clipboard from time to time. Cygwin comes with an X server among many other things. Grab your copy here. It is an installer stub and will download additional stuff from the internet based on the components selected for installation. Cygwin/X which has the X server is not selected for installation by default. 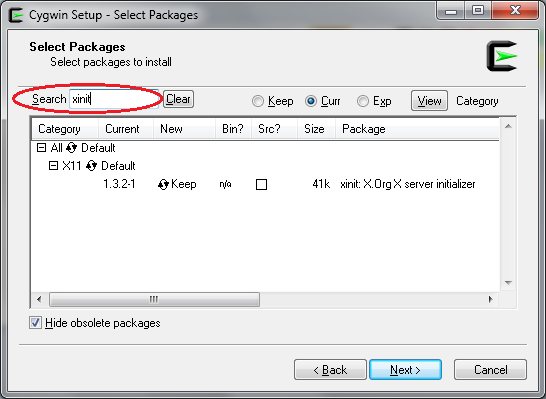 You can do it manually by selecting the Xinit package from the X11 section as shown. Cygwin has so many packages, that it is easier to search for what you want. Cygwin installs a whole bunch of stuff (standard Unixy stuff). It is after all meant to provide a Unix style native environment in Windows. Even if you don’t use any of the other Cygwin stuff, it is worth it just for the X server. I am using Cygwin X Server for over a year now and it has never failed me. Also I put a shortcut to Cygwin X Server in my Startup folder so that it is automatically started whenever my PC boots. Most of the time I use Linux on my desktop and use the default X server for remote X clients. On the rare occasion of having to use Windows to ssh to a Linux server, my preferred X server is Xming. Now by default the fonts displayed by default X server on Linux is much more readable than the tiny size displayed by Xming. My initial solution was to increase the font sizes of the few applications (gvim, gnome-terminal) I typically used. But once I switched back to Linux desktop, the fonts were too big. There is a better solution. By default Xming uses a DPI of 96. We can increase this value to have bigger font sizes (not only fonts, everything scales proportionately). I found anything in the range of 108-112 DPI to be appropriate. Xming takes the DPI config as part of its command line parameters. Right click on the Xming icon and select properties. You should see a similar dialog box. You can edit the “Target” field (see screenshot) and add -dpi 108 to set the DPI config to be 108. A notepad with all options should popup. 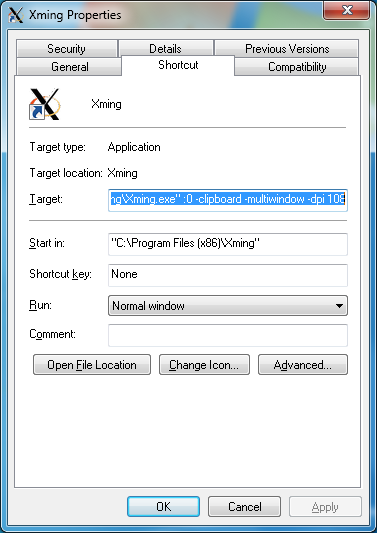 EDIT: If you are having trouble with Xming hijacking the clipboard, you can give Cygwin X Server a try.